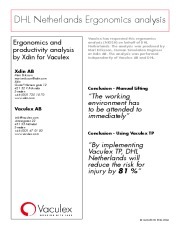 Another Ergonomic Uplifting Solution by Vaculex increases productivity and reduces costs. Vaculex TP Scale is a new unique vacuum lift that lifts up to 45 kg. It weighs and lifts in a single motion. A built in scale allows each parcel/product to be weighed while being lifted. If required, the operator is able to set a weight limit. If the load exceeds this weight, a signal will indicate so. We are happy to tell you more about the advantages and to learn more about your operation to see how we can help you! Please contact us at info@vaculex.com or visit vaculex.com. "By implementing Vaculex TP, DHL Netherlands will reduce the risk for injury by 81 %"
Versatile, ergonomically designed and easy to operate, the Vaculex ParceLiftTM increases productivity and efficiency when loading and unloading loose loaded cargo into/out of trucks and containers.